Since 2005, Gaelchultúr has been providing specialised Irish language training to public sector bodies to help them fulfil their obligations under the Official Languages Act 2003. Most of the company’s training is aimed at front-line staff who are in regular contact with the public and the aim of the courses is to enable those staff members to provide customer service through Irish. We have also developed courses for staff members who need to reach a high level of competency in Irish to enable them to work through the language. Gaelchultúr seeks to make the learning of Irish an enjoyable and beneficial experience for the participants, a pleasure rather than a chore. For further information about the approach used by Gaelchultúr when the company is asked to run a course in a public sector body, please click on the General uncertificated courses link in the left-hand column. 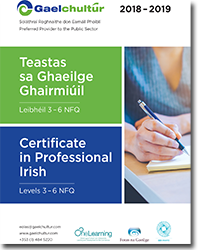 Gaelchultúr is now offering a specialised accredited course, Certificate in Professional Irish, which is aimed at public sector employees, at Level 3, Level 4, Level 5 and Level 6 on the National Framework of Qualifications (NFQ). For more information about this course, please click on Certificate in Professional Irish - Level 3 (NFQ), Certificate in Professional Irish - Level 4 (NFQ), Certificate in Professional Irish - Level 5 (NFQ) or Certificate in Professional Irish - Level 6 (NFQ). To download the Certificate in Professional Irish brochure, please click here.